Stuffed Mushrooms I LOOOOOVE mushrooms! It's such a fun and delicious way to get some of your vegetables in for the day! MORE than mushrooms, I love CREAM CHEESE! 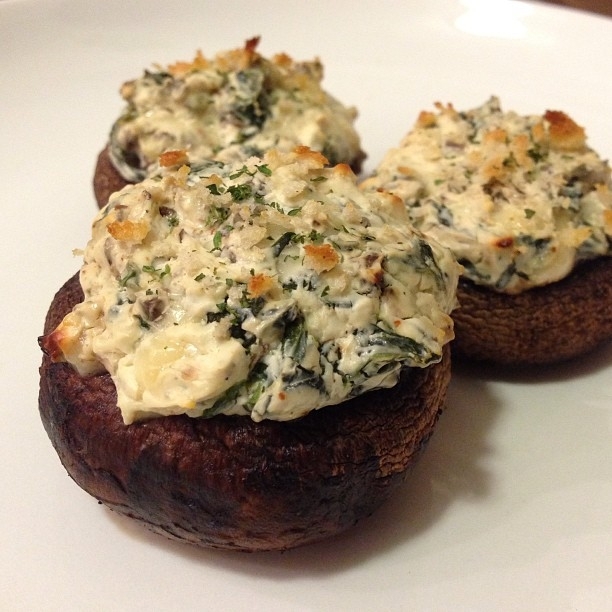 You really can't go wrong with this stuffed mushrooms combo!! A great vegetarian option and side dish, and still packing that protein! Cut stems off of 12 mushrooms, reserve and set mushroom caps aside. Dice mushroom stems, and cook in a skillet with 1/2 tsp minced garlic and spinach, until leaves are wilted (a few minutes, I used spray rather than oil). Meanwhile, combine cream cheese and greek yogurt. Microwave a few seconds to loosen up so it can be easily stirred (not nearly melted, though!) Add in parmesan, remaining 1/2 tsp garlic, garlic powder, black pepper, salt and cayenne. Stir cooked vegetables into cream mixture. Bake for 15-20 minutes, until crumbs begin to brown.